In an interview with Brazil’s Total Race Alonso said Ferrari needs to win 3-4 races in a row and someone take Vettel out or he needs experience technical problems. This is the only way Alonso sees himself overcome the 46 point deficit he has to Vettel. Vettel has built a substantial lead in the championship and while he does not have to win each race, he just needs to ensure no one else romps away with consecutive wins. The problem Alonso has is that while he, Hamilton and Kimi is chasing Vettel, all Vettel has to do is focus on getting on the podium while the other three take wins from each other. One thing we cannot forget is that Vettel is practically racing on his own now, Webber will not help him. With technical problems hitting Webber’s car the odds for it to happen to Vettel’s car is very low. What else can Alonso do to win the Drivers Championship? Dutch newspaper De Telegraaf reports that Giedo Van der Garde has some options available to him for the 2014 season. His management Jan Paul ten Hoopen and Jeroen Schothorst have named three possible teams they are working – Sauber, Williams and Force India. De Telegraph speculates Sauber and Williams could be good options because of the funding associated with the driver through his sponsor McGregor. While nothing is said about current team Caterham it is anticipated they want to get Heikki back in to help them develop for 2014 and Pic will keep his seat due to the Renault connection. Van Der Garde is not worried at the moment though, “It makes no sense for me to already be thinking about next season. There are still eight races to go“. Another Dutchman whose career seem to be over before it started is Robin Frijns. Sources of De Telegraph claims Sauber will not take up their option on the racer and when asked Frijns responded, “I have no idea. I have heard nothing, I know nothing“. While Frijns is regarded as a real talent in the paddock his future is limited due to the fact that he does not bring any sponsorship with him so is there any of the larger teams willing to take a chance on him? Maybe his comment about Red Bull treating their drivers like dogs will come back to haunt him. Private equity firm LDC, owned by Lloyds Banking Group, is in advanced talks over spending “millions” on backing a management buyout of Silverstone Circuits, which promotes and hosts the British Grand Prix. They previously owned shares in Marussia which they sold at a profit so as with most private equity firms, there must be money to be made in the Silverstone deal. Zwolle kindly pointed us in the direction of this story. McLaren team principal Martin Whitmarsh believes Kimi Raikkonen is “determined” to leave Lotus, and has hinted his outfit could be tempted to sign the Finn. Well well, let us distil Whitmarsh’s comments. He says they could be interested in Kimi if he is available, which he is but they have not yet approached him. What we are seeing here is more of a “hurry up” for current race drivers Button and Perez. McLaren is admitting they have given the drivers a dog of a car but expect their drivers to do more with the car and should they not then their seats are not safe. Hamilton is faster than Button so for Perez to be slower than Button… McLaren really need a fast driver. Another angle, is McLaren perhaps sending a message to potential sponsors saying if you don’t pay up in time your man may not be with us next year? Luckily Frijns is called Robin, and not Robert…..
And I think he has more talent than Guido van der Garde. I really hope Robin will get a drive in 2014.
funny how we all like it when drivers speak their minds and tell it how it is like Webber and Raikonnen, because its refreshing in the stale, groomed, and corporate environment of F1. It seems that actually this only works when you are in a top team, as Frijns just seems to being tarnished with the whinger brush for it, despite the fact that his comment that the Red Bull young driver program is a dead end, is so far bang on the money. I grant you its not a smart move on his part for his career, but its funny how a lot of the media and commentors on site are turning on him for speaking out. Despite the fact it daft for their careers, surely, we’d rather more did it? 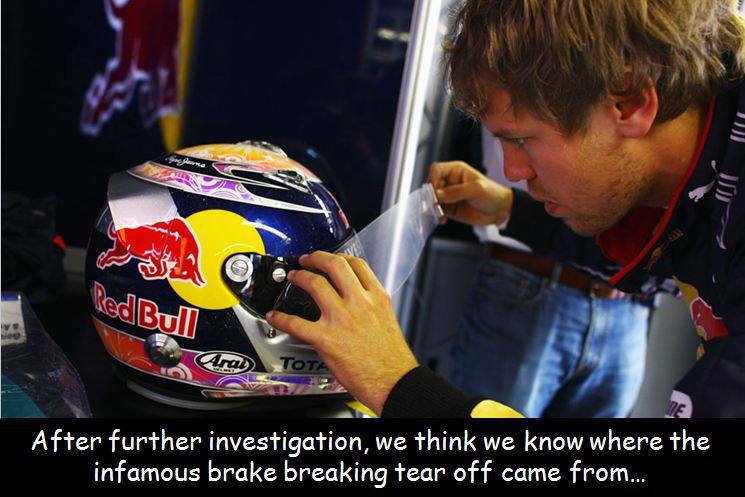 how does webbers car being hit by technical problems decrease the odds of this happening to vettel? unless you are suggesting that red bull is giving all dubious, new or untested parts to webber and none to vettel. if alonso could get piquet to crash for him, maybe he can suggest to the higher ups at ferrari that they threaten massa into running over vettel. webber would probably also be willing to do the deed, maybe that is why he is always having trouble with his clutch. I’d dare to bet that the chances of Frijns getting a drive next season is bigger than for van der Garde….. we’ll see, and I’ll collect my beer next season, ok? Domenicali: […] we focus on what we have to do, we know what we have to do. And if our drivers go back to the point that I was thinking and you were thinking about, then they know what they have to do. If they don’t, well, they know what there is after. Interviewer: They know where the door is you mean? The English educated Hamilton probably doesn’t realize that to push someone you have to be behind them. I sure Vettel will be quite happy for Hamilton to be behind him for the rest of the season. Face facts Hammy. The advantage Mercedes got from the illegal tyre test is gone and you’re slipping backwards. I expect to see Lotus ahead Mercedes at Monza and you’ll be back to where we were before the illegal tyre test. Are the red team invisible? Cry babies like Dancing Donkey see their red cars even with eyes closed as images are tatooed inside their eyelids. Considering that this years aero package won’t fit on the 2011 car due to the change from pull-rod to push rod suspension in 2012 nullifies your argument. English site = Hamilton fanboys. What else is new. I don’t sign up as a Hamilton fan, nor Alonso nor Vettel. I want to see the best cars and the best drivers slugging it out. And yes, some times teams push the boundaries of the rules but that’s to be expected. Red Bull is doing it, Ferrari did it, Benetton did it, blimey, I’d be disappointed if all the teams don’t do it! New? Well, certainly not your rhetoric anyway. So can I just ask, IF mercedes win from now on, especially if they look quicker than the rest (and yes I am saying IF), are you going to shut the hell up about the tyres finally? Obviously still a sore point with the Hamil, I mean Mercedes fans. To answer your question, if at Monza either Mercedes wins and Alonso and one Red Bull finishes I will. Surely, its from Monza onwards? I mean, I know so far we have had a load of moaning goal post shifting so that when Merc did well it was ‘the test’ and vice versa, but surely if the advantage is gone, its gone from now on right? Excellent, thats all I wanted to hear. Its not a sore point really, its been clear for many months you are only really interested in making antagonistic statements, and I’ll admit to being curious about whether you are an elaborate internet troll who has a great time trying to wind folks up, or whether you spend your whole life this angry. I half hope its the former for your sake, I mean, why keep coming here and making yourself this grumpy? Life’s too short man. Hence being interested to see if there was any point of agreement or negotiation could be reached, trolls don’t as a rule negotiate. And go ahead, I’m not a mercedes fan, I am a Hamilton fan, I think I have explained that before. I don’t like this ‘troll’ business. I disagree with what Cav says here, and on many other posts too. But labelling someone a troll is just wrong when they have a consistent gripe about something they believe to be unfair. This is F1. The sayings ‘if you’re not cheating, you’re not trying’ and ‘its only cheating when you get caught’ were probably invented by the piranha club by way of defense at an FIA hearing. We have fun here, intersperced with the occasional strong debate (or small row). I enjoy this. I don’t enjoy name calling. In my opinion, the only thing which compares to being a ‘troll’ is to feel comfortable labelling someone with the title. @Colin, I think I understand your opinion of me, sorry about that, but we can’t win them all. However, frankly, the guy flat out has a go at English education higher up, and its not the first time he has just lain into ‘hamilton fans’ as if everyone is just a knuckle dragging moron who enjoys watching him race. back through Cavs posts, and see how many times he just picks out something about Hamilton or ‘mercedes fans’, he knows a lot of readers are, and it is never presented in a even mannered fashion, its clearly just an attack. I have never seen a post of his without some kind of derogatory slant on it since I have been coming here. I’d like to think we do have fun here, but I will show him respect when he does likewise because frankly its been a little lacking. Trolling is an act, an act I strongly suspect may be going on here, and I don’t use it lightly, its a shame you think that makes me equally bad.